With the holiday season fast approaching, now is the perfect time to get out and see all the amazing shops that Atlanta has to offer, and to purchase gifts for your loved ones from independent stores and artists. But if you’re unsure if your aunt would like a painting of a cow wearing boots or a vintage purple rain coat, play it safe and stop into one of Atlanta’s wonderful bookstores and grab her a copy of a new book by her favorite author. Photo courtesy of Little Shop of Stories. Books make perfect gifts for anyone – the curious child, the armchair traveler, the amateur historian, or even the know-it-all in your life. With so many amazing independent bookstores to explore, you’re sure to find something for everyone on your list this holiday season. Plus, you can always justify a book if you’re in a Treat Yo’Self mood. They keep an impressive stock of all the hottest books of the season for children and adults, and their cheery atmosphere and helpful booksellers are sure to squash that gift hunting stress that inevitably follows any holiday shopping adventure. The fun at Little Shop isn’t regulated to the gift-giving season; they also run successful and fun summer reading programs, year round book clubs for children and adults, and host author events and book-inspired events through the year. Lawrenceville – If you prefer used books (it’s eco- and wallet-friendly!) Books by the Pound in Lawrenceville is your one-stop shop. This warehouse-sized store is brimming with book finds from every genre, field, and taste. They carry a wide range of classics, romance, historical fiction, nonfiction, and children’s books along with a selection of vintage hardbacks. Recently moving across town, the new shop offers nearly double the old selection, with discounts and special offers to boot. They really do charge by the pound: a pound of books will run you between $1.99 and $2.99. They offer a variety of discounts, including student and veteran, and are constantly updating their Facebook page with daily deals and long-term offers. If you’re looking to get rid of some good condition books of your own, you can visit their trade-in desk for store credit towards your purchase, as well, and they now offer gift cards. Be warned: this is not the kind of bookstore where you go in knowing exactly what you want, find it, and leave. This is my favorite kind of bookstore – a browsing bookstore – meaning the books aren’t arranged neatly on shelves in alphabetical order by author. Instead, Books by the Pound is populated with tables with books stacked only according to genre. It isn’t easy to find exactly what you are looking for (but will be soon as they introduce book-finding kiosks), but is perfect for finding treasures that you didn’t realize your life was missing that will turn into favorites. Little Five Points – Charis Books and More is truly a gem in the crown of independent Atlanta bookstores, being the oldest feminist independent bookstore in nation. Founder Linda Bryant opened the shop in Little Five Points 42 years ago, and the shop has been a staple of the area ever since, but in early 2018, the shop will be moving across to Decatur to take up residence on the campus of Agnes Scott College in an historic building. The shop specializes in feminist, cultural studies, and lesbian, gay, bisexual, and transgender fiction and non-fiction, and offers a range of selections for children and adults. At Charis, they host a range of events with visiting authors and activists, and additionally host book clubs in safe spaces. They are the home to various children’s story times, writing groups, and open-mic nights as well. Their nonprofit arm, Charis Circle, additionally offers support and community to Atlanta’s activist groups and organizes volunteer groups around the city. On their website, you can make orders, check out the event calendar, read about their impressive history, and browse staff-pick lists. This holiday season, support your historic feminist bookstore and the communities they strive to lift up. Atlanta – Another of Atlanta’s long-standing book stores, A Cappella Book opened in Little Five Points in 1989 and is still one of Atlanta’s premier book stores, though they are now located on Haralson Avenue in Atlanta. A Cappella hosts author events and signings, book clubs, and participates in festivals and city-wide events so you can join in no matter where your interests lie. You can even attain membership to the A Cappella Choir which entitles you to amazing rewards like special seats at events, a book tab so you don’t have to swipe or count out cash each time you stop in to make a purchase, and discounts on your favorite items. Along with offering new releases, A Cappella also offers vintage and rare editions and signed first editions from your favorite authors. Stop in for the perfect gift for your special someone or snag a gift card and let them experience the magic of A Cappella for themselves. Decatur – Located off North Decatur Road, not far north from the town center, Eagle Eye Bookshop offers a wide range of new and used books. This cozy and fully stocked shop hosts various author events throughout the year, and you’re sure to find a bookish gift for anyone on your list, whether it’s a traditional book, a special edition, or some book themed merchandise. Working to support independently published authors, Eagle Eye allows authors to apply to use their shop as an event venue and also work with authors to sell their books via consignment. If e-books or audiobooks are more your speed, they also partner with My Must Read to offer a wide variety of e-books and audiobooks which you can purchase online and access with your computer or smart device. If you’re looking for a really special gift, check out their huge collection of signed books which would be a gift unlike any other. You can find more information about their audiobooks, e-books, store policies, and signed editions on their website. Chamblee – Have a book-lover in your life that seems to have more books than a local library? Maybe the best place to snag their gift is at Atlanta Vintage Books, where you can find rare, collectable, and unique editions of nearly any book you desire. Owned and operated by a book-loving couple with extensive history in the publishing business (who bought the 25 year old store in 2007), Atlanta Vintage Books is stuffed with rare and historic books, with enough niches to interest even the pickiest of readers. This cat-friendly shop offers a load of books in genres from nautical to gardening alongside the traditional collection of fiction. You can browse the closely stacked shelves for hours or find what you’re looking for on their website. The store also has a collection of historic and vintage newspapers and magazines with both iconic and mundane headlines. Stop in this cozy, friendly shop to find a real treat for the bookworm on your list this holiday season (and relieve some holiday stress with generous cat ear rubs). Tall Tales Book Shop Inc.
Atlanta – This independent bookstore offers a range of new, indie, and general interest books to suit any reader. They also offer book ordering if you can’t find what you need in-store, and will perform an out-of-print book search for you if there is a certain book you’re trying to get your hands on. Additionally, they offer discounts on bulk book ordering for events or parties, and will wrap your purchase for you in-store (a relief if you’re like me and can’t make heads or tails of a roll of wrapping paper!). They do author events each month during the year, and even run a book-of-the-month subscription club, which is a perfect gift for an avid reader or someone who can never decide what to buy! The service and staff in Tall Tales is unparalleled, so stop in today and get a recommendation from their expert staff. Atlanta – If you’re looking for a more refined selection, maybe some interesting books for your coffee table or office shelves, Cover Books may have what you’re searching for. Located in the Atlanta Contemporary Art Center, Cover Books focuses on collections in art, design, food, photography, and wine. They also carry zines and hard-to-find magazines, all with an avant-garde taste. Stop in this gallery-esque space to find a unique book for the artists and craftspeople on your list. Ponce City Market – This New York City transplant bookshop opened just over a year ago in the Ponce City Market complex to the delight of booklovers all over the city. A favorite of New York Magazine, Posman has only two other locations, both of which are located in New York City, and both of which are highly sought after in Rockefeller Plaza and Chelsea Market. The Ponce City Market location oozes that New York City modernism, with more books in the small shop than you can put your eyes on. Stocked with books, merchandise, greeting cards and stationery, the shop also boasts an impressive children’s section and plenty of art-chic selections alongside bestsellers and classics. They also offer author events, signed editions, and various other community events, so next time you’re in the area, stop by for a gift for someone on your list (and even one for yourself). Decatur – Touting itself as “your favorite local bookstore, everywhere,” Decatur’s newest bookstore opened just a few years ago, and though it isn’t technically an independent bookstore, it’s a must visit for the budget gifter. Providing new and used books at a discounted price, Half-Price Books also does major business in buying books from customers, some of which stock their shelves and others go to large donation projects. Their biggest project is the Million Book Project, which sees books given to charitable causes in order to recycle books, saving them from landfills all over the country. They also have an application process for local organizations to request donations set up in their name so you can donate your used books to causes in your community. The shop stocks fiction, non-fiction, movies and TV series on DVD, collectable and rare books, as well as textbooks and book merchandise. The Decatur location also sells local artists prints on consignment. In an effort to support our educators, Half-Price Books also offers a discount card for librarians, teachers, and educators, which they can use on purchases year-round. Stop in today with some old textbooks or novels and leave with a few names marked off your Good List! Vinings – Feeling a little tired after a day of bookshop browsing? Stop into Read Shop and have a cup of joe while you browse their impressive collection of new and indie books. This hip spot comes from the mind that brought Atlanta Archer Paper Goods, The Merchant, and Collier Candy Company. Specializing in the New York Times Bestseller list, the shop also carries classics, children’s literature, and various home and garden selections. Want more cool coffee spots in Atlanta? Check out our list of Atlanta’s best brew locations. Abigail is a recent graduate of Agnes Scott College where she studied English Literature. She enjoys reading Gothic fiction, watching fantasy television, and writing about books. 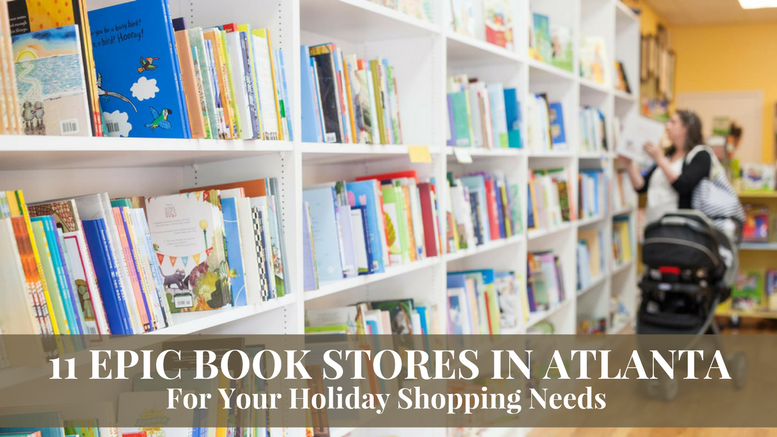 Be the first to comment on "11 Epic Book Stores in Atlanta For Your Holiday Shopping Needs"